This time last year, Burroughs Audubon was busily applying for a Monarch Conservation Grant from the National Fish and Wildlife Foundation. At first glance it may seem a bit odd that a birding group would want to save a butterfly. But Burroughs did- for many reasons. Quality monarch habitat supports many insects and invertebrates that birds feed on. Remember it takes 6,000-9,000 caterpillars to feed a brood of chickadees in the 14-16 days from hatching to fledging. Grassland birds are among the group in steepest decline and large monarch habitat, 100 acres or more, is also grassland bird nesting habitat. Monarch migration and metamorphosis connect many budding scientists to our natural world. Lastly, and maybe more important than all the rest, we didn’t want to see this iconic migration end on our watch. So we worked with partners from the Kansas City Native Plant Initiative and ultimately submitted a bi-state, collaborative, multi-sector grant. In September 2015, we received word Burroughs Audubon was one of the 20+ grants awarded. Lots of work, planning and scheduling followed. In the fall of 2015, along with the National Wildlife Federation, Powell Gardens, Bridging the Gap and the Missouri Prairie Foundation, we met with the KCMO Mayor’s office. 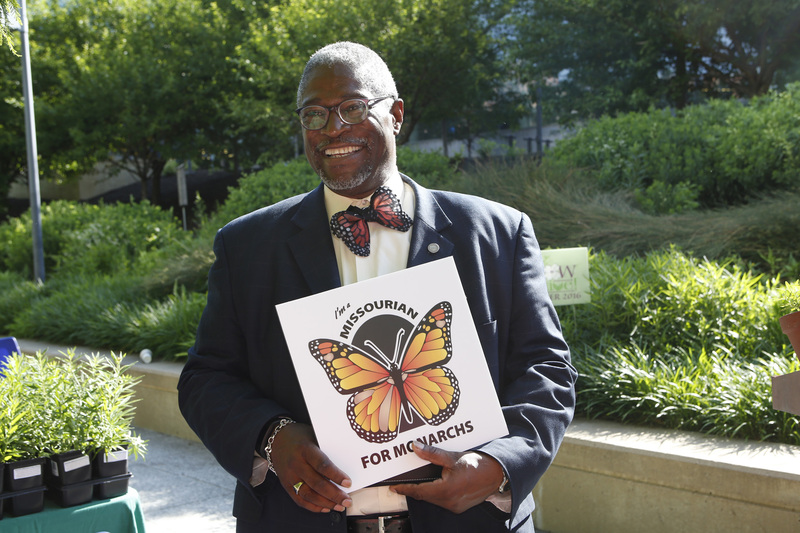 We discussed the plight of the monarch and asked the Mayor to support the grassroots efforts going on around the Greater Kansas City area by signing the Mayor’s Monarch Pledge. A short time later, Mayor James did just that! The support and creation of monarch habitat across the city has taken off like a prairie fire. From schools to parks to utility easements, monarch habitat has taken a hold in Kansas City. The pinnacle of habitat creation will be 100 acres going in along the Mill Creek Streamway Trail by Shawnee Mission Park this fall. Enough for grassland nesting birds…. and monarchs! All this brings us to today, June 1. 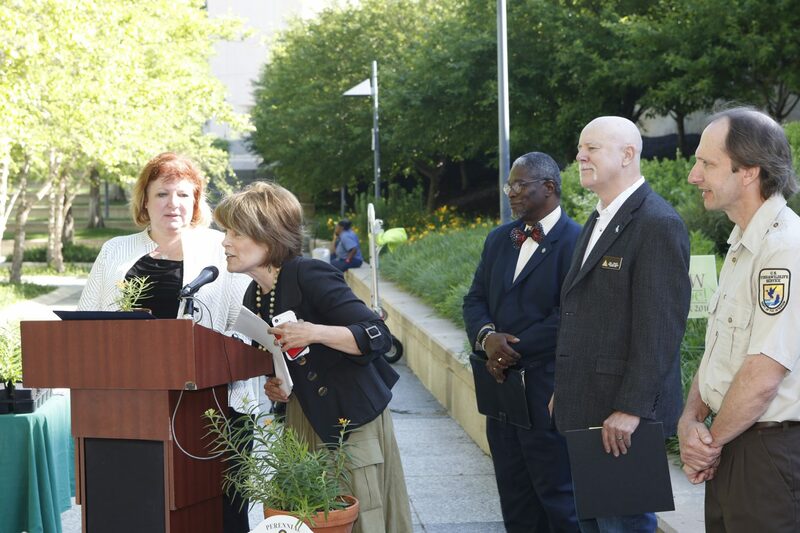 The day Mayor James declared “Milkweed for Monarchs Day!” in Kansas City. On a beautiful morning that had been threatening rain in the forecast for days before, conservation leaders from both sides of the state line showed up to support this important initiative. Behind the scenes the Mayor’s office, Kristin Riott from Bridging the Gap, and Burroughs have been working for weeks to pull together the perfect proclamation ceremony. It paid off when the media rolled up and so many leaders from the community were in attendance. Just before 9:00 am Mayor James walked out of City Hall and made his way to the podium. Flanked by Bill White from the Missouri Department of Conservation, the best conservation department in the country, and Patrick Martin from United States Fish and Wildlife Service, the group that made monarch conservation a national priority, Mayor James stood in front of the Ilus W. Davis butterfly garden and affirmed the city’s commitment to monarch conservation. His proclamation included the city’s support of the partners working across the metro to save an orange and black butterfly and all that its decline signals. Unlike so many other conservation issues the monarch migration can be saved yard by yard, plant by plant and person by person. This amazing creature that we share with Canada and Mexico has found a way to pull together conservation and passion across state lines creating an unprecedented, collaborative and coordinated effort. Mayor James said, ‘the little things impact the big things and that’s important because we are all connected.’ A little milkweed and native nectar plants in your yard can go a long way to saving a butterfly and the rest of the birds and animals that are also dependent upon the same habitat….. we can all be saving something… one native plant at a time.